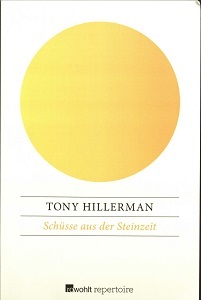 This is a reprinted version of German translation of Dance Hall of the Dead titled Shots from the Stone Age in German. The original German translation is done by Helmut Eilers and published in 1976. White paper covers printed in yellow typography of title and in black for author. At the center of the cover, the circle transiting from light yellow to dark yellow at the center.